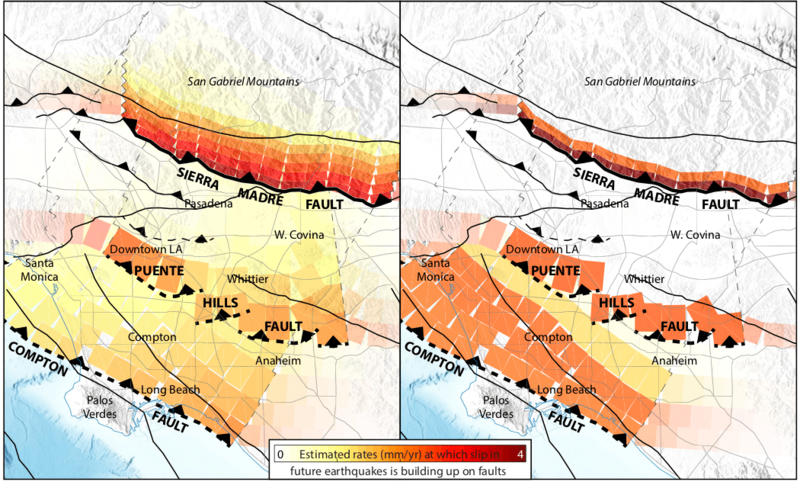 Thrust-faulting earthquakes are a fact of life in Los Angeles and a threat to it. Three such earthquakes in the second half of the 20th century painfully etched this ongoing threat to life, limb and infrastructure into the memories and the backs of the minds of many who call this growing metropolis home. The first struck 40 seconds after 6:00 AM on a February morning in 1971 when a section of a thrust fault beneath the western San Gabriel Mountains ruptured in a magnitude 6.7 tremor. The earthquake killed 60 people, including 49 in the catastrophic collapse of the Veterans Administration Hospital in Sylmar, the closest town to the event (which is often referred to as the Sylmar earthquake). Among other structures hit hard were the newly built Newhall Pass interchange at the junction of Interstate 5 and California State Route 14, of which multiple sections collapsed, and the Van Norman Dam, which narrowly avoided failure in what could have been a cruel deja vu for a city that had been through deadly dam disasters in 1928 and 1963. Devastation at the Veterans Administration Hospital in the 1971 Sylmar earthquake. Photo courtesy of Los Angeles Times. Sixteen years later, a section of the Puente Hills thrust fault ruptured in the magnitude 5.9 Whittier Narrows earthquake, killing eight people in East Los Angeles and bringing attention to a class of thrust faults that do not break the surface, called “blind” thrust faults, which will go on to form a key part of this story. 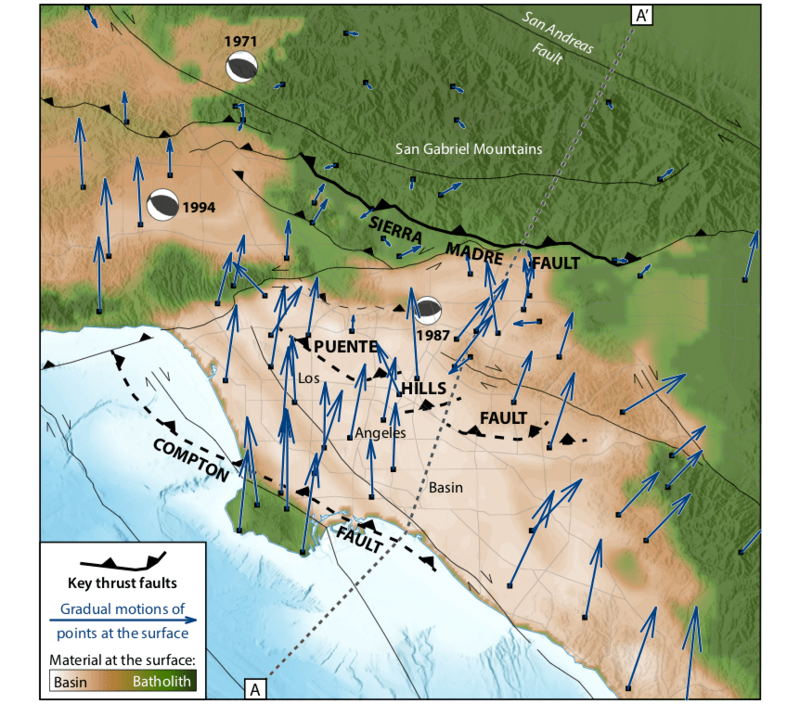 Then early on another winter morning in 1994, an even more deeply buried blind thrust fault ruptured beneath the San Fernando Valley in the magnitude 6.7 Northridge earthquake, causing tens of billions of dollars in damage and taking 57 lives. One of the fatalities was Los Angeles police officer Clarence Wayne Dean, who died on his motorcycle when a span of the Newhall Pass interchange that had been rebuilt following the 1971 Sylmar earthquake collapsed again as he was riding across it in the predawn darkness. Collapse of the Newhall Pass (I-5/CA-14) interchange in the 1994 Northridge earthquake. Officer Dean died on the downed section of overpass at right. The interchange has since been renamed the Clarence Wayne Dean Memorial Interchange in his memory. Photo courtesy of CNN. Thrust earthquakes like these, in which the top side of the fault is thrust up and over the bottom side, will likely strike Los Angeles again in the 21st century. They may in fact pose a greater hazard to the city than earthquakes on the nearby San Andreas Fault because they can occur directly beneath the central metropolitan area. This means that a city that has found so much of its identity and place in history from being improvised as it went, and from being a cultural and economic melting pot, now faces the unwieldy task of readying its diverse infrastructure and populace for the strong shaking these kinds of earthquakes can produce. One way that the earthquake science community has been assessing the seismic hazard in LA is by using geodesy – long-term, high-precision monitoring of the deformation of the Earth’s surface – to locate sections of faults that are stuck, or locked, causing the Earth’s crust to deform around them. It is this bending of the crust, or accumulated strain, that is violently released in earthquakes; therefore the locations where this bending is taking place might indicate where future earthquakes will occur, and perhaps how large and frequent they could be. Several decades of geodetic monitoring have shown that the greater Los Angeles area is being squeezed from north to south at roughly 8-9 millimeters per year (⅓ inch per year), about one-fourth the rate at which human fingernails grow. Thrust faults, such as those on which the Sylmar, Whittier Narrows and Northridge earthquakes struck, are ultimately driven by this compression. Geodetic data, tectonics and material properties relevant to the problem. Dark blue arrows show the north-south tectonic compression inferred by Argus et al. after removing deformation caused by aquifer and oil use. Black lines are faults, dashed where blind. Background shading is a measure of material stiffness at the surface based on the Community Velocity Model [Shaw et al., 2015]. “Beach balls” show the locations and senses of slip of the 1971 Sylmar, 1987 Whittier Narrows and 1994 Northridge earthquakes. Figure simplified from Rollins et al. . 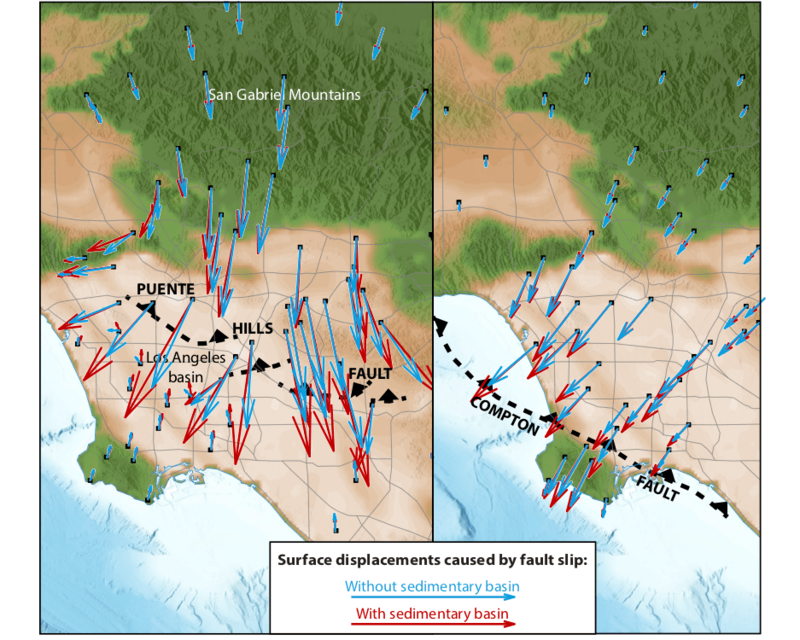 The task of linking the north-south tectonic squeeze to specific faults encounters several unique challenges in Los Angeles. First, the city sits atop not only active faults but also several aquifers and oil fields that have long provided part of its livelihood and continue to be used today, which deforms the crust around them. Geodetic data are affected by this anthropogenic deformation, to the extent that a recent study used these data to observe Los Angeles “breathing” water from year to year and even to resolve key hydrological properties of particular sections of aquifers. This spectacular deformation, which furnishes science that can be used in resource management around the world, has the unfortunate effect of obscuring the more gradual north-south tectonic shortening in Los Angeles in these data. Animation from Riel et al. showing long-term subsidence of the Earth’s surface due to use of the Los Angeles and Santa Ana aquifers. Second, the faults are a complex jumble. 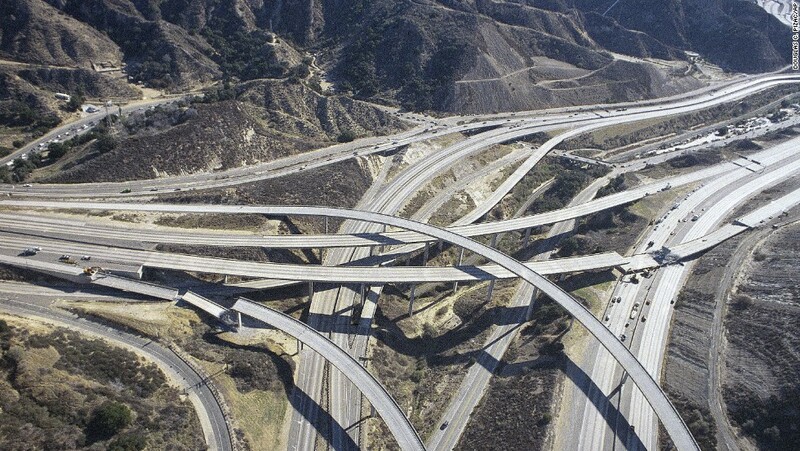 The crust underlying Los Angeles is cut by thrust faults, strike-slip faults like the San Andreas Fault and subparallel to it, and other strike-slip faults nearly perpendicular to it. Although these faults all take part in accommodating the gradual north-south squeeze, the relative contributions of the thrust and strike-slip faults in doing so has been the subject of debate. The problem of estimating strain accumulation on subsurface faults is also generally at the mercy of uncertainties as to how faults behave at depth in the Earth’s crust and how they intersect and link up. Third, Los Angeles sits atop a deep sedimentary basin, created when a previous episode of extension created a “hole” in the crust that was gradually filled by sediments eroded off the surrounding mountain ranges. These sedimentary layers are more easily deformed than the stiffer rocks in the mountains around the basin, complicating the problem of estimating strain accumulation at depth from the way the surface is deforming. Finally, as in the case of the Puente Hills Fault, some of the major thrust faults in Los Angeles do not break the surface but are “blind.” This means that the bending of the crust around locked sections of these faults is buried and more difficult to detect at the surface. Basin sediments affect the relationship between fault slip and deformation at the surface by up to 50% for the cases of the Puente Hills Fault (left) and Compton Fault (right). For the same fault slip, the basin is more compliant and so the Earth’s surface is displaced more (red arrows) than if it were absent (blue arrows). Figure simplified from Rollins et al. .
Several important advances over the past two decades have paved pathways towards overcoming these challenges. The signal of deformation due to water and oil management can be subtracted from the geodetic data to yield a clearer picture of the tectonic shortening. The geometries of faults at depth have also come into focus, as earth scientists at the Southern California Earthquake Center and Harvard University have compiled decades of oil well logs and seismic reflection data to build the Community Fault Model, a detailed 3D picture of these complex geometries. A parallel effort has yielded the Community Velocity Model, a 3D model of the structure and composition of the Southern California crust that is internally consistent with the fault geometries. A cross section of faults and earthquakes across central Los Angeles from Rollins et al. . Red lines are faults, dashed where uncertain; pairs of arrows along the thrust faults show their long-term sense of slip. White circles are earthquakes. Basin structure is from the Community Velocity Model. Recently, a team of researchers from Caltech, JPL and USC (with contributions from many other earthquake scientists) has begun to put these pieces together. Their approaches and findings were published in the Journal of Geophysical Research (JGR) this summer. On the challenge presented by the complex array of faults, the study found that the strike-slip faults probably accommodate less than 20% of the total shortening at the max, leaving the rest to be explained by thrust faulting or other processes. Three thrust faults, the Sierra Madre, Puente Hills and Compton faults, stand out in particular as good candidates. All three appear to span the Los Angeles basin from west to east, and the Puente Hills and Sierra Madre faults have generated moderate earthquakes in the last three decades, including the Whittier Narrows shock and a magnitude 5.8 tremor in 1991. Paleoseismology (the study of prehistoric earthquakes) has also revealed that these three faults have each generated multiple earthquakes in the past 15,000 years whose magnitudes may have exceeded 7.0. Alternative models of how quickly strain is accumulating on the Compton, Puente Hills and Sierra Madre Faults, assuming that the transition between completely locked (stuck) and freely slipping patches of fault is gradual (left) or sharp (right), simplified from Rollins et al. . Gray lines are major highways. How fast is stress building up on these faults? Exploring a wide range of assumptions (such as whether the transitions between stuck and unstuck sections of faults may be gradual or abrupt), the team inferred that the Sierra Madre, Puente Hills and Compton faults appear to be partially or fully locked and building up stress on their upper (shallowest) sections. The estimated total rate of strain accumulation on the three faults is equivalent to a magnitude 6.7-6.8 earthquake like the Sylmar earthquake once every 100 years, or a magnitude 7.0 shock every 250 years. These back-of-the-envelope calculations, however, belie the fact that this strain is likely released by earthquakes across a wide range of magnitudes. The team is currently working to assess just how wide this range of magnitudes practically needs to be: whether the strain can be released as fast as it is accruing without needing to invoke earthquakes larger than Sylmar and Northridge, for example, or whether the M>7 thrust earthquakes inferred from paleoseismology are indeed a likely part of the picture over the long term. This picture of strain accumulation will sharpen as the methods used to build it are improved, as community models of faults and structure continue to be refined, and especially as more high-resolution data, such as that used to observe LA “breathing” water, is brought to bear on the estimation problem. The tolls of the Sylmar, Whittier Narrows and Northridge earthquakes in lives and livelihoods are a reminder that we should work as fast as possible to understand the menace that lies beneath the City of Angels. Argus, D. F., Heflin, M. B., Peltzer, G., Crampé, F., & Webb, F. H. (2005). Interseismic strain accumulation and anthropogenic motion in metropolitan Los Angeles. Journal of Geophysical Research: Solid Earth 110(B4). Riel, B. V., Simons, M., Ponti, D., Agram, P., & Jolivet, R. (2018). Quantifying ground deformation in the Los Angeles and Santa Ana coastal basins due to groundwater withdrawal. Water Resources Research 54(5), 3557-3582. Rollins, C., Avouac, J.-P., Landry, W., Argus, D. F., & Barbot, S. D. (2018). Interseismic strain accumulation on faults beneath Los Angeles, California. Journal of Geophysical Research: Solid Earth 123, doi: 10.1029/2017JB015387. Shaw, J. H., Plesch, A., Tape, C., Suess, M. P., Jordan, T. H., Ely, G., Hauksson, E., Tromp, J., Tanimoto, T., & Graves, R. (2015). Unified structural representation of the southern California crust and upper mantle. Earth and Planetary Science Letters 415: 1-15. 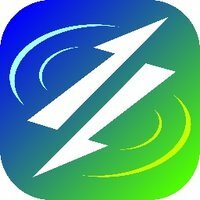 Earthquake Network is a research project which aims at developing and maintaining a crowdsourced smartphone-based earthquake warning system at a global level. 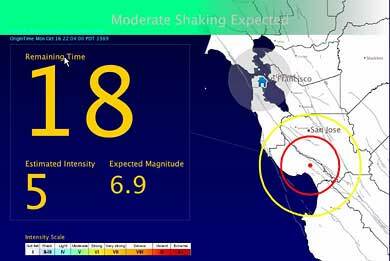 Smartphones made available by the population are used to detect the earthquake waves using the on-board accelerometers. When an earthquake is detected, an earthquake warning is issued in order to alert the population not yet reached by the damaging waves of the earthquake.